The ultimate objective of Continuous and Comprehensive Evaluation is to bring about qualitative improvement in all learners. It is of course a must that the quality of instruction and that of the instructor must be high. Given the fact that every student comprehends and learns at a different pace, there must exist a mechanism by which instruction as well as evaluation can be provided on a continuous and on demand basis. Students therefore must be able to learn and re-learn any topic, anytime, ideally in a classroom like environment, be able to assess their comprehension continuously and compare their standing of the subject matter with their peers. We will help you with exactly that. Our 24x7 learning solutions are designed to address Continuous and Comprehensive Evaluation with particular emphasis on the Learning Process and Evaluation with remediation. ENSURE that a learner has good and complete understanding of fundamental concepts. ASSIST the students in enhancing their ability to interpret and solve complex problems. EMPOWER the students to manage their day better and indeed achieve comprehensive Education. Studying with TopChalks was the best part of my Class X preparation. I scored 100 marks in Maths. Mr. S.C. Goel is the former principal and HOD, Maths, at Air Force Bal Bharati School, Lodhi Road, New Delhi and he has over 30 years..
Mr. Sajid Hussain is the HOD Physics at Delhi Public School, Maruti Kunj, Gurgaon. 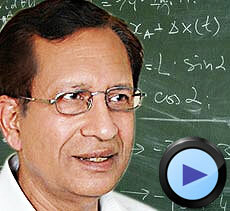 Take a look at any one of his lectures from any physics chapter of your choice. You will realize that there is no need to be afraid of Physics. He has made Physics an easy subject for numerous students, who have performed extremely well in the Board exams and also captured seats in top engineering and medical colleges throughout India. Mr. Sajid Hussain can do the same for you. He is a M.Sc. (Physics) graduate from AMU with 15 years of teaching experience and has been associated with top notch schools throughout his career. At Delhi Public School, Maruti Kunj, his students have consistently graduated with top marks in Physics. Some of his students travel hundreds of kilometers just to be tutored by him. Mr. Sajid Hussain has achieved these extraordinary results by simplifying what others seem to believe as difficult concepts to grasp. Take a look at a number of his sample lessons to see how he makes Physics easy for a student to learn. Come, experience effortless learning of Physics...- Mr. Sajid Hussain,HOD Physics, Delhi Public School, Maruti Kunj, Gurgaon. Mr. Shachindra Sharma (M.Sc. Delhi University, B.Ed. 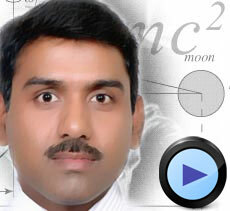 and CSIR Fellow) is one of the most popular, innovative and result oriented Chemistry teacher. He is working as a senior faculty (Dy. HOD) of Chemistry at Delhi Public School, R.K. Puram; India&apos;s Premier institution. For the last 18 years he has taught thousands of students in India and abroad. His simple but unique method of teaching has made Chemistry an easy to understand and high scoring subject. His students have been top achievers not only in the Board exams but also in many of the competitive tests conducted by top Engineering, Medical and other famous Universities of the world. Mr. Sharma&apos;s long cherished dream of making quality teaching available to the needy students is now a realty with TopChalks.com. He has prepared each lesson carefully, leisurely over a long period of time without any time pressure or constraints. At TopChalks.com his lessons facilitate the students to learn Chemistry in the most relaxed atmosphere. These lessons are available online, 24 x 7, for the students to use at their discretion. Mr. S.C. Goel is the former principal and HOD, Maths, at Air Force Bal Bharti School, Lodhi Road, New Delhi and he has over 30 years of experience teaching Maths. He has made his students excel in Maths by relating it to analogies and events in day to day life. He is proud of the fact that his students are not only super achievers in Board Exams but many of them are also rankers in competitive exams such as IIT-JEE. In his course at TopChalks.com, Mr. Goel has extensively covered every concept of XII Board Maths and regardless of where the student is in his/her preparation, Mr. Goel&apos;s lessons will assist the student in boosting his/her performance and confidence to significantly higher level. He has explained the concepts, problems and solutions in a number of different ways, in order to ensure that every level of student benefits from his teaching. The student can be assured that he/she will be extremely well prepared to score high on the XII Board Maths exam. Mrs. Poonam Jubbal is a highly trained and experienced educationist in the field of Biology with a B.Sc. and M.Sc. in Zoology and M.Ed. in education. She was a topper at Hindu College in her B.Sc. and M.Sc. exams with a 7th rank in Delhi University in the B.Sc. exam. Teaching Biology is her passion. She has taught Biology for the last 25 years at top schools like Delhi Public School and other premier institutes like Aakash. Many of her students today are accomplished Doctors, Scientists and Scholars. She has perfected a way to help students learn Biology in a systematic way, one that produces excellent results. Take a look at her sample lessons to see for yourself why she is such a sought after instructor.